Charlie is one of the major loves of my life! We rescued him as a very small pup, and he has been an important part of our family ever since. I hadn’t intended to get a dog… A friend from the country, who breeds working dogs, had phoned me to say that he was giving away pups. His children had left his breeding boxes open and instead of pure-bred kelpies and cattle dogs, he had a mixture of each. He even had some kelpie-labrador crosses, and that was what I had my heart set on. But when I got to Benson’s to view the puppies, one fat little bundle of fluff came and sat squarely on the toe of my boot and pawed my leg. 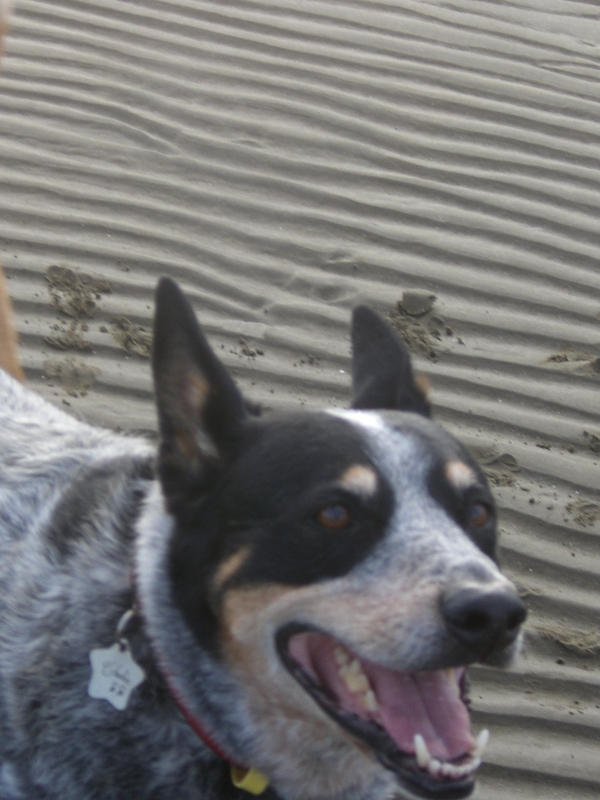 It was love at first sight, and that’s how I ended up with Charlie, a kelpie-blue heeler cross. When we bought our first cattle property, my grandfather, the son of a drover, suggested that we call our place ‘Charlie’s Run’. Back in the day a farm was often called a run, but this time we would name it not after ourselves, but after our dog. My grandfather thought this was an excellent plan, and so did we. 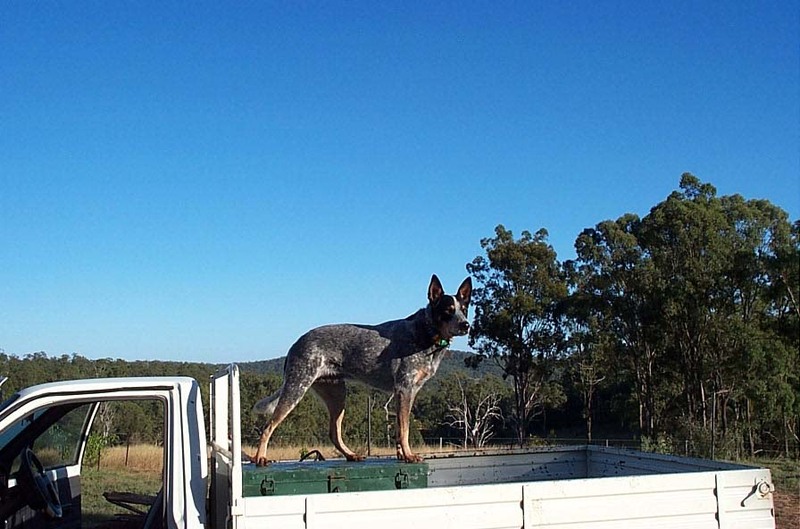 Charlie has had an outstanding record as a working dog, and as our friend. He’s travelled across the country with us, sleeping out under the stars as we’ve explored Australia, protecting our valuables, and keeping us company. 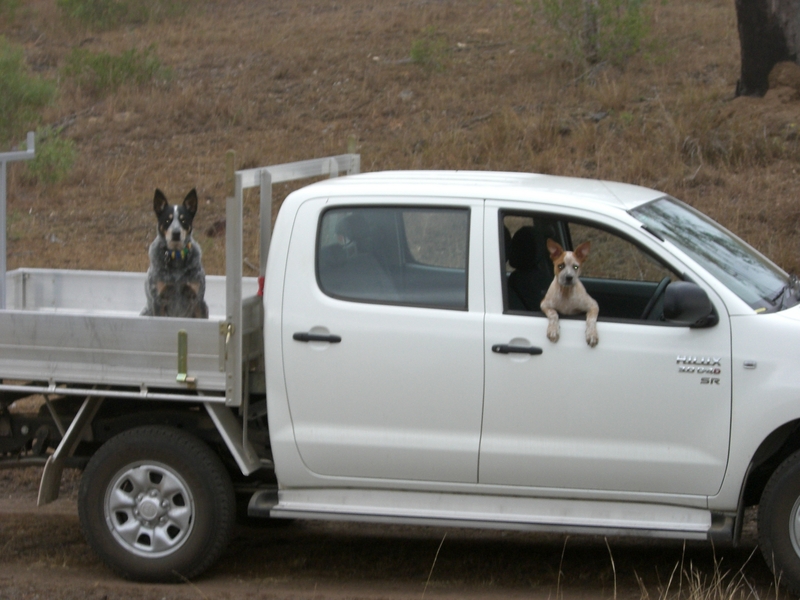 Not only has he been a great help on the farm; mustering the herd, working the cattle yards, guarding things in the back of the truck when we’ve gone to town – he’s also kept us safe. He intervened between a wild cow and Ben, saving Ben’s life and getting a broken jaw in the process. He stopped me from stepping on a deadly brown snake, and he has saved Bert, our youngest dog (countless times), from acts of puppy insanity such as wanting to bite the chainsaw or the whippersnipper. The boys – Charlie all wise and sensible, Bert an insane but totally lovable pup! He has also been unceasingly protective of me. Whenever Ben has been away, Charlie will position himself between me and anyone who comes to the door. He always lets them know that he’s on duty, looking after me. Whenever one of us has been sick, or down, he’s been right there at our side like a shadow, comforting us with his presence, always knowing how much or how little to intervene. He’s taught Bert how to work the yards, and taken our mad puppy (also a rescue dog – you can read Bert’s story here) from a place of crazyness to a place where Bert can now do most of what Charlie did before, while Charlie sits and watches from under a tree, keeping me company. Even now, he’s sitting at my feet as I write this. But now it’s our turn to look after him. Charlie’s getting old. He’s sixteen, seventeen on the fourth of July. And a few weeks ago he had surgery to remove a very aggressive cancer that had manifested as an ugly and fast-growing tumour in his soft-palate. You could tell by the look on the vet’s face, even as he was trying to give us an up-side, just how bad the news really was. We were all amazed at how Charlie bounced back from the extensive surgery. He’s got a gleam in his eye and a wag in his tail. And we’ve been spoiling him even more than usual. We all know we’re on borrowed time now. I’m sure he does too. And we won’t let him suffer. No living in pain for him, no indignities. Hard as it will be, when the time comes, we will look after him, the way he’s always looked after us. Resting, after a big run around the new farm. There is something so pure about the love of a dog, their joy in living, their devotion and loyalty. My life has been all the richer for knowing Charlie, and as heartbreaking as it will be when his time comes, it also helps me see the cycle of life, and remember that everything is okay. Today, I’m looking after my dog. He’s been a bit wobbly on his feet the last week or so – a tumour on his spine it seems. He’s injured his paw, stumbling a night ago and ripping one of his hind claws almost off, necessitating a dash to the vet, where we sedated him and pulled off the whole nail. Charlie’s home now, with a pink bandage on his foot, and my unceasing attention. He’s been ordered to rest for a few days. No outdoors, no running around. I’ve been delivering Charlie’s medicine by hiding the capsules in freshly peeled prawns. Why not? He deserves them, and they are his total favourite. My old dog looks at me with a twinkle in his eye. He’s not silly – he knows he’s on a good thing. Ben and Bert have gone back to the farm to muster and attend to the never-ending string of jobs. While Charlie and I are cosied up together on the lounge, looking forward to prawns and tasty treats in the nice warm house, down at the farm they’ll be out in the frosty dawn, tramping through wet paddocks getting cold and muddy, and living on bachelor cooking. 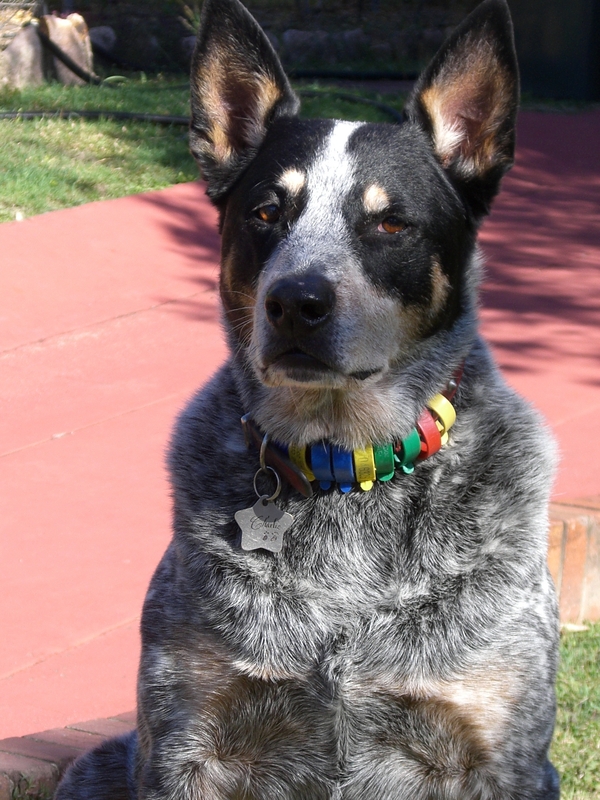 This entry was posted in Life, Love and tagged Australia, blue heeler, brown snake, cancer, cattle dog, cattle dogs, cattle farm, devotion, dog, euthenasia, far, farm life, farming, love, loyalty, man's best friend, nursing duties, pet, puppy love, rescue pets, suffering, wild cow by Cauldrons and Cupcakes. Bookmark the permalink. So Beautiful Nicole. Dogs know how to give unconditional love and Charlie is so lucky to be with you and your family who love him just the same. Now I know why you shared that picture and that quote :”it takes someone very special to make you smile with tears in your eyes”. I had instant tears reading your post, but the intensity of the love I felt makes my heart smile. Very strong. 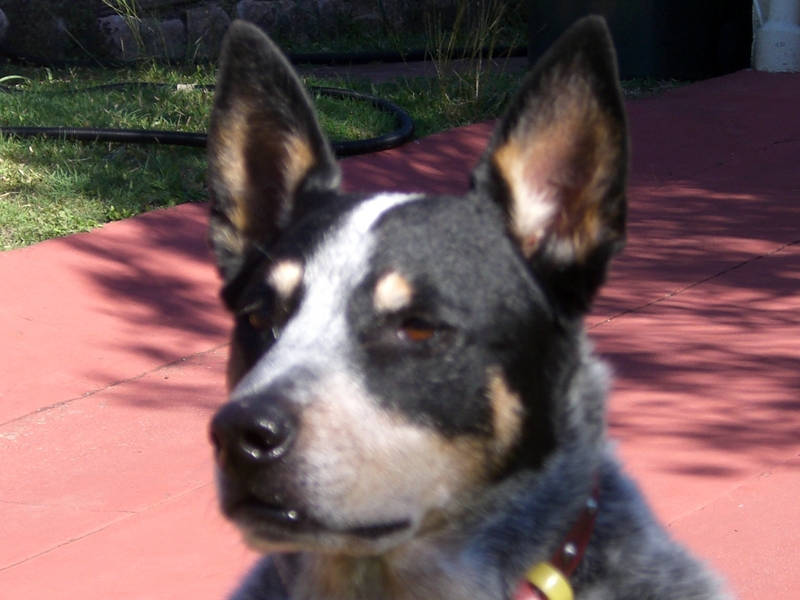 We also in the same boat at the moment our blue heeler x kelpie is also15- 16 on borrowed time on daily heart and lung tablets. (He was my first baby). 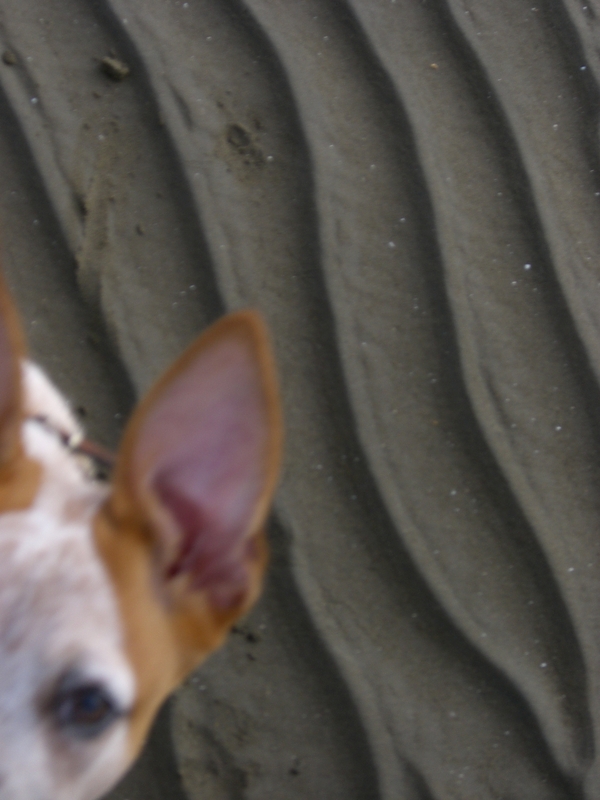 I am also v.greatful to have had Rusty’s luv and companionship in my life.. I love him so much..
Charlie is a handsome and dignified caretaker! How lucky for you to have had the gift of Charlie all this time. And how lucky he is to have your love and devotion in his old age. I hope these remaining days are full of love, and quiet times, and liberal doses of prawns. What a dog! Our pets are as much a part of our families as our children are. They depend on us totally for their care and in return give us so much more than we can ever give them – unconditional love, always. What a sweet story that shows your warm and caring heart. He’s beautiful! We had to put out little Doc down nearly 2 weeks ago. I hope your remaining time with Charlie is wonderful! So touching I needed a moment to cry before I could see the screen to type! A dogs unconditional love , there is nothing quite like it! 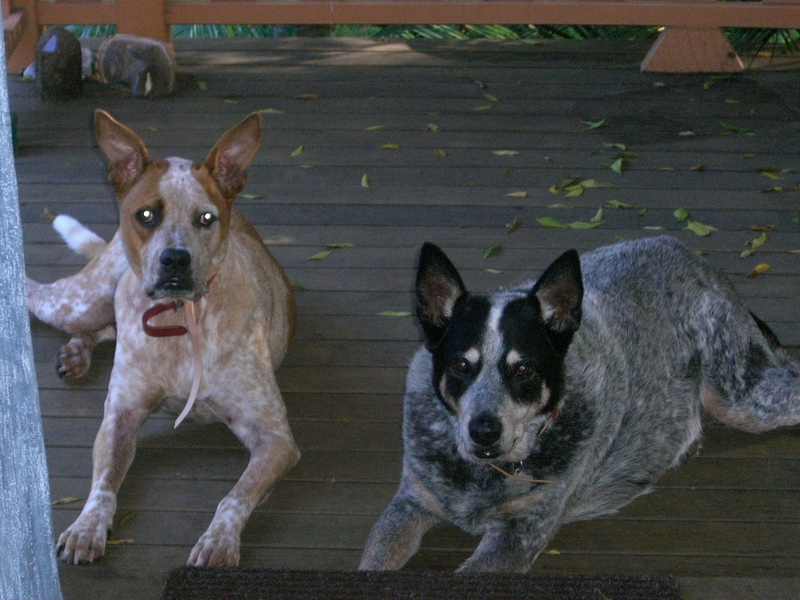 A very timely blog Nicole as I too care for my four legged darlin! It is indeed an honor to be able to care for them and protect them as they have done for us! Charlie is such a wonderful friend! He sounds like the most loyal, protective, warm, loving and selfless soul. You are very lucky to have such a good member of the family, as he is very lucky to have you! I am glad he is getting prawns. He really does deserve them. I’ve never had a dog but I can see that your two are wonderful companions and that you have a real connection with them both. I think Charlie couldn’t have a happier life and I’m delighted to hear that he’s having his favourite prawns and extra care and attention. It’s nice to think of life being a cycle, where the end is not the end. So this won’t be the end for Charlie, but a new chapter in his book. Love the picture of Bert at the wheel of the truck and Charlie in the back. Says it all really. Charlie has taught Bert everything and now it is Bert’s time to take the wheel. You’re welcome. Bert sure is a smart dog getting you out of the house for a walk! Your beautiful story of this love affair started making me beam, and in the end, it made me feel for Charlie.But you have your time with him, make the most of it.He is lovable. My pet dog had a similar story.As children, me and my younger bro couldn’t think of a better name than Blacky, as he was black all over.Our neighbor’s dog gave birth to six pups, she wanted us to take one.My bro went to pick one.I was waiting eagerly at the lounge window to have a glimpse of his selection.There were white with black patches, and black with white patches.He was the only one completely black.The way he looked at my bro melted his heart.When i saw him, he was struggling to break through my bro’s hand.On taking a closer look, i knew why he chose blacky.His eyes shone as gems through his thick black coat. He was adorable.Before we could open the kitchen door, he ran and stood outside welcoming us.He felt really jealous when we bought a few lambs and tied them in the place which was his favorite, and he was lead out in the backyard for a few days.He reacted fiercely at first, and then i could hear him whine, longing to be near us, his paws peeping in from under the small gate connecting our front yard to the back.Finally, he won back his place.How he hated baths!!! He died of complex liver problems he had since birth.In his last days, he had high fever, and me and mom kept cold packs on his head.He felt so better, that he used to close his eyes.Even in extreme lethargy he never failed to wag his tail. Dogs make us addicted to faithfulness, we hunt the same in human relationships as well! Heartwarming story of love and devotion … quite a handsome pup as well!! I love being a caretaker and guardian to mine, and I know the love and devotion they extend to our lives.